Atlanta-metro 7X Best of Houzz Winner. Residential Landscape Architecture Design & Build. Husband & wife team of Landscape Architect & Designer (Danna) plus Project Manager & Residential Licensed Contractor (Conrad). Together we develop landscapes to be "experienced", not just viewed from afar. Projects begin with comprehensive design that creates a personalized environment and outdoor living area that is beautiful, organized, functional, problem solving & ecologically sustainable. We have a vast knowledge from over 70 years combined experience in the following areas; bed prep & planting, grading for drainage, erosion control & terracing, patios, driveways, decks, pools, outdoor living area, porches, pavilions, integrated room additions. We insist on bed prep and raised beds for optimal growing conditions. Of special interest are: cohesive design for outdoor living, hardscapes that blend in rather than dominate, ecological design, integrating perennials & edibles with ornamentals, plant diversity, native plants, pollinators, beneficial insects, wildlife habitats, bird sanctuaries, organic edibles, xeriscaping, water conservation, permaculture, sustainable, healing gardens, discovery play gardens, playscapes & raingardens. Atlanta's Tilting Windmill Landscape Design specializes in residential and commercial landscape and garden design and installation. Our approach is to create the most perfect, custom landscape possible. We handle all phases - design, installation of plants and hardscape, construction of decks or other unique features, and even ongoing maintenance (maintenance is in a more limited service area). Every home is unique, and so every one of our gardens echoes and plays on the character of its home. A frequent question I hear is, "Where did your name come from?" Tilting Windmill is a reference to Cervantes' Don Quixote. Don Quixote was a man, who after reading too many heroic tales of chivalric knights, lost his mind and decided that he was, himself, a knight errant. On one of his misadventures, Don Quixote, riding through the Spanish countryside, comes across a group of windmills. Again, because he's gone mad, he does not see windmills, but rather sees a group of giants. He proceeds to charge the 'giants,' attacking them with his lance (tilting is another term for jousting), and much hilarity ensues in 17th-century-pratfall fashion. As such, in our modern lexicon, the term 'tilting at windmills' has come to mean 'fighting imaginary enemies,' a definition which has never set well with me. I've always preferred a more romantic definition. To me 'tilting at windmills' is the same as fighting an unwinnable battle. But are we not nobler for the fight? The same is true for a garden. There is no way to 'win' a garden. A garden is never done. We are working with living things in a garden. Living things grow, they change form, and they die. So, while a garden is never done, there are moments in a garden when everything is harmonious and in balance. We strive for those perfect moments. And we are nobler for that pursuit. We're doing all we can to make Atlanta more beautiful, one landscape at a time. Our passion is the extraordinary. Give Tilting Windmill a call at (404) 334-3093 or click the "Contact Me" button to send us a message and let's see what we can do for your landscape. 50% Off Your Entire Design! Full service Landscape Architect, Design/Build firm offering services ranging from site work, grading, plantings, drainage, irrigation and lighting to hardscapes that include pools, masonry, carpentry, fencing and all types of exterior construction. "Wildly elegant garden design with native plants and edibles" Specializing in using native plants and hardscape to create beautiful pollinator meadow, woodland, rain, and edible gardens for your home. Outdoor Makeover and Construction is a 90-time award-winning company and one of the preeminent design-build contractors in the Atlanta, Georgia, area. Led by the Makeover Brothers Navid and Omid Derakhshan, we are a family-owned and -operated business and a one-stop shop for a comprehensive selection of professional outdoor services, including deck and screened in porch construction, landscape architecture, hardscape design and installation, front yard and backyard landscaping, and more. We create visually stunning outdoor living spaces for discerning homeowners in and around Atlanta who demand nothing less than superior results and a worry-free customer experience. Outdoor Makeover and Construction is more than just a landscaping company. We specialize in high-end outdoor overhauls – projects that require sophisticated planning, engineering savvy, design creativity, and an unwavering commitment to achieving the client’s specific outdoor living goals. Let our talented designers create a 2D, 3D, or 4D master plan for your unique space. From design to installation our team members communicate with you and manage all the details so that you don’t have to stress. Our services include landscape design and outdoor construction from architectural concepts through installation. Specializing in outdoor living spaces, we incorporate converging elements of elegant landscape contours, fire features, water features, wooden additions, and curated plantings to tie the whole yard together as a complete all senses experience. Eric King has been creating award-winning gardens in metro Atlanta for decades. These amazing outdoor rooms blur the line between inside and outside. One of his strengths is his ability to listen to a client's needs, enabling him to design jobs that can be built, not just look good on paper. King Landscaping works with clients to design landscapes that thrill them, look great and improve with age. Land Plus Associates is an award winning landscape architectural design firm with an emphasis on fine residential design. Commissions include work throughout the Eastern US and Midwest . The firm provides comprehensive design and construction management services. Prospect Design Company provides innovative and thoughtful solutions to outdoor design problems and has the ability to build and install these landscape solutions! Each problem is different and requires a one of a kind design that makes it unique from all others. Prospect Design Company creates one of a kind designs that aren't just pulled off the shelve. We strive to be simple and traditional in the name of affordability and environmental sustainability. We have our own team of designers and installers with over 30 years of experience! Howard Design Studio is a landscape architecture firm based in Atlanta, Georgia known for its Classic Garden Designs with work across the United States. The firm's work has been published in many magazines and books. Howard Design Studio is the recipient of the prestigious Philip Trammell Shutze Award for Landscape Architecture. Creating "Gardens to Love" is what we do. Caring for our customers is how we do it. Michaelangelo's Sustainable Landscape & Design — Angie's List 2018 Super Service Award® Winner ABOUT MICHAELANGELO'S Our Philosophy is to engage the client in the creative process of their landscape design, establish a plan that includes hardscapes and horticulture that fulfill that vision, and enhance the landscape sustainably, with minimal environmental impact. Since 2002, Michaelangelo's Sustainable Landscape and Design Group has been committed to providing professional residential and commercial sustainable landscape and design services that enhance a home or business with minimal impact on the environment. In addition to being trained and knowledgeable in all aspects of horticultural science, every Michaelangelo's team member is attentive to the professional landscaping needs and vision of each client, residential or commercial. Our experienced landscapers seek each client input in regard to specific problems, like irrigation and sprinkler repairs, garden design, and landscape maintenance, and we provide one-on-one attention throughout the entire landscaping process to ensure desired results are met. Thanks to strong partnerships with local businesses, our yard and lawn designs offer superior accessibility of materials, allowing us to keep our costs low. Our Guarantee Michaelangelo's maintains a consistently high level of professional landscaping, lawn and turf care, and personal attention to each project. We strive to provide you with work of the highest quality, and we offer a 100 percent satisfaction guarantee: if you are not 100 percent satisfied for any reason, Michaelangelo's will make it right. 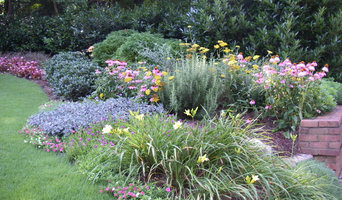 Ed Castro Landscape, Inc. is an award winning, full service landscape firm that provides everything necessary for a homeowner to enjoy a unique and sustainable landscape. As a full service design, construction, horticulture and maintenance firm, our talented and experienced staff of designers and landscape professionals take pride in transforming your outdoor living space. Our team is dedicated to developing and executing your vision. From inception to completion, our project managers ensure that appropriate landscape management guidelines are in place and every detail is meticulously preserved. We specialize in high-end residential properties and pride ourselves on successfully working with a wide variety of clients and budgets. Whatever your vision, be it a lush green lawn with accent plants, a complete recreational backyard with pool or an outdoor kitchen and entertainment space, our experts will develop a plan that suits your taste and budget. Additionally, long-term plans can be developed to implement your design over time. ECL consistently endeavors to be a proactive, eco-friendly operation: - We reprocess all green waste from properties and job sites. - We have been using industry leading fuel-efficient fleets and smart cars since 2002. - We help in reducing fuel consumption, traffic congestion, and greenhouse gas emissions. - We are consistent leaders in environmental design, practice, service, LEED, SITES and conservation projects. We also place a strong focus on civic engagement and community participation. Our team regularly takes part in fundraisers and community events, and the company donates to numerous local charities and institutions. We hope you will take the time to get to know us and let us work with you on all of your landscape needs. Charles' background and philosophy combine to create a very unique approach to landscape design and client relations. A Charles Hodges Garden is a unique and seamless integration of both the home and its occupants with the outside world. Every element of a Hodges Garden reflects painstaking attention to detail. Charles utilizes many indigenous plants and materials in his designs and brilliantly couples the natural with the architectural. Each project contains traditional elements applied in distinctive and creative ways. The Southeastern Flower Show has recognized Charles' uncanny ability to creatively blend tradition and innovation with two consecutive "Best In Show" awards and the Smithsonian Garden requested permission to duplicate one of his many original water features. 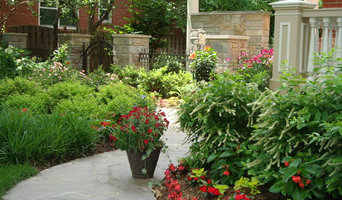 Steve Montgomery and Company is a multi-service landscape/construction company with much experience and creativity. It is much easier to use one company for all your needs. We have been in business since 1985 and have been providing top quality services since the beginning. 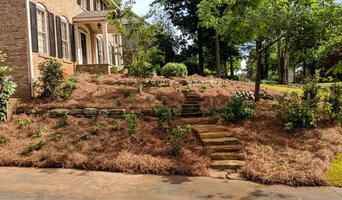 Because Steve has been in the landscape industry in the Atlanta area for 32 years, he has extensive design, consultation & installation experience. With his background and education in art, he knows how to combine beauty with function to achieve exactly what you are looking for. Steve uses plants as well as water features, lighting & hardscapes in his designs to achieve a concept through an artist's eye. He can show you his portfolio of many wonderful properties or take you on a tour. Watch for Steve on HGTV's landscaping program "Groundbreakers", where one of our projects is featured from start to finish. You will not be disappointed. The work of this outdoor professional includes most everything surrounding a home's exterior. A landscaping architect can even work with the home architect to choose the right spot for your North Druid Hills, GA house. From there the North Druid Hills landscaper will develop preliminary concepts for your front or backyard design based on individual needs including the climate and activities that will take place, as well as layouts and planting plans. Landscape architects will also design any structures or outbuildings that will be added to the space. Any grading changes that will be added to the yard are also the responsibility of the architect. This includes any drainage modifications. An engineer can also be responsible for these tasks, but licensed Georgia landscapers are fully capable. Like building architects, they will produce preliminary concept drawings as well as detailed construction documents and planting plans. Three-dimensional renderings and illustrative plans are all supplementary. A North Druid Hills landscaping designer generally will have ecological, aesthetic and technical training, which helps them maximize the potential of your outdoor space. Keeping in mind both style and functionality, garden designers analyze your architecture and yard to produce a plan that may or may not include location and materials for walkways, patios, water features, fences, garden aspects and more. In addition, a landscaper in North Druid Hills, GA will carefully assess your geographic region to choose plants, trees and flowers that will flourish naturally, as well as address concerns such as drainage, screening and soil conditions. Certain landscape designers only help with the planning portion, while some may deliver the plans and then oversee a hired landscaping contractor. Others — typically following a design-build approach — take care of both the design and all aspects of the landscape architecture and construction. 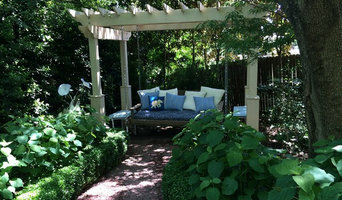 Find a North Druid Hills landscape architect on Houzz. Narrow your search in the Professionals section of the website to North Druid Hills, GA landscape architects and designers. You can also look through North Druid Hills, GA photos to find a space you like, then contact the professional who posted the photo.